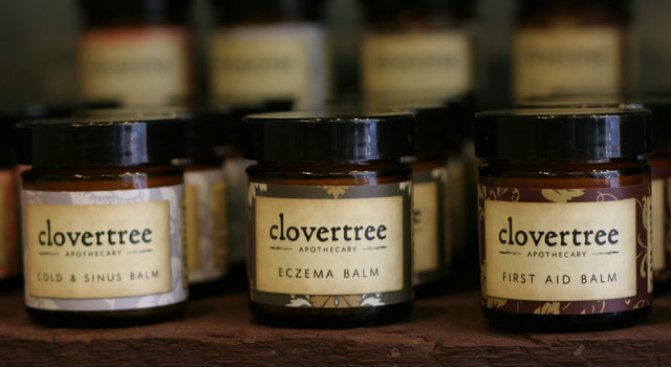 Bohn's clovertree balms will soothe what ails you. Amy Bohn didn’t set out to go into the spa business -- the spa business actually found her. Bohn, 38, a former teacher and stay-at-home mom, re-careered in 2004 to become a licensed massage therapist. Shortly after setting up shop, her clients began asking for recommendations for treatments and products to build on the therapeutic benefits of her services. Bohn even received special requests from allergy sufferers and clients with medical conditions. Seems they weren’t having much luck with traditional products, which contain ingredients that might irritate sensitive or delicate skin. “Once you research it…you can never go back,” Bohn explains of the eye-opening experience of educating herself about additives and preservatives used in mainstream beauty products. Spurred on by her clients’ requests and her own curiosity, she began developing a concept that revolved around offering the pampering experience of a spa using only natural and organic products. And the rest, as they say, is history. Five years later, Bohn’s spa*habitat includes outposts in Plano and Dallas, with a third on the way come Aug. 10 in the WinStar World Hotel and Casino. Bohn’s sunny, sassy disposition is right in tune with her auburn bob and the diamond stud she wears in her nose. Naturally talkative, her animation level amps up even higher when the subject turns to clovertree Apothecary, her new product line which debuted this summer at the spa. When she set out to create her own lotions, soaps, balms and lip products, Bohn asked herself, "Why not choose the purest thing that we can?" With that question as her guiding philosophy, she developed clovertree using as many organic ingredients as possible, eschewing artificial fragrances and colors, parabens, synthetic chemicals and petroleum products. In their place, clovertree combines natural oils and herbs in a full body care line that feels like heaven (and smells even better). Bohn’s clovertree Peppermint Lip Balm glides on like silk -- it’s not greasy in the least. Use it in conjunction with the Sugared Vanilla Lip Scrub for two-step pout perfection. The Shea Butter Lotion in Evening Jasmine is equally luxurious. Smooth on a little at bedtime, and you’ll awaken to soft, smooth, fragrant skin. Finally, Bohn’s balms are her pride and joy. Beginning with a base of olive oil infused with 20 herbs and botanicals (think rose petals, calendula and red clover), Bohn adds essential oils to create each unique healing formula. For example, clovertree Muscle Relief Balm contains the herb arnica, believed to ease soreness and promote the healing of bruises. Unlike some infamous muscle rubs on the market, this one smells ever-so-slightly of mint -- instead of your Grandpa’s medicine cabinet. Explore the full line of clovertree products at your nearest spa*habitat. And while you’re at it, why not check out one of their award-winning treatments as well? For a full listing of services and locations, visit www.spahabitat.com.